Image caption Teacher Lisa Cole said the women "now have a nice round skill set"
A computer club set up to help women without IT skills is now creating websites for other community groups. Cracking IT, based in Bristol, is led by website designer and teacher Lisa Cole who said their aim was "to become a group of women who are self-funded". Ms Cole said: "In the first lesson we learned how to use Instagram, and the next session was about online safety." Bristol Women In Trades, said it was an "ideal collaboration" to have the club create their website. The weekly group, which started in November, is for women only and is funded by banking software group Sword Apak. Lisa Cole said: "IT is seen traditionally as a male dominated area but that's changed now. "Having it as a women only group means it's a safe place for women just getting into IT - no question is too silly. We all support each other." She said they were contacted by Bristol Women In Trades after they saw how the club had "revamped" the website for the local charity Baggator. 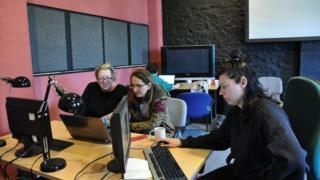 Jenny Stringer, from Bristol Women In Trades, said: "Getting this group to build our website is an ideal collaboration. "Women in tech are also marginalised so it helps to increase the opportunities for women to learn those digital skills whilst at the same time helping us grow." Self-employed gardener Ellie Del Arbol said it was "essential" she learned more about computers. "Especially with my business - from doing my books to building a website. I feel a lot more confident," she said. Aumairah Hassan said she had "very basic IT skills" but wanted to learn how to do "more creative things". Ms Hassan said: "We wanted it to be a safe place for all women but particularly BAME women, who are part of our local community and may prefer a woman only environment due to religious or cultural reasons. "And I see making the website for Bristol Women In Trades as two female community organisations coming together. The club has also been approached by volunteer recruitment group Bristvol to make their website.